Samia Amin is a principal researcher and the director of Workforce Development at AIR. She is passionate about promoting evidence-based innovation in the public sector. Amin brings extensive domestic and international experience helping federal, state, and local governments and foundations to develop and refine programs. She leads implementation and experimental and quasi-experimental impact studies. She is especially committed to using behavioral insights, human-centered design, and research-driven piloting for continuous program improvement. 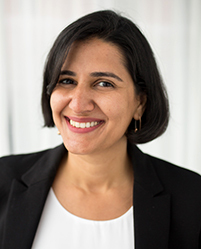 Prior to AIR, Amin served as project director, deputy project director, and task leader on a wide variety of projects for the U.S. Department of Labor at Mathematica Policy Research. As project director and deputy project director of the original Department of Labor Behavioral Interventions (DOLBI) project, Amin helped lead the design and implementation of three experimental behavioral trials, two of which were nationwide. She was the principal investigator of a trial designed to increase retirement savings among Department of Labor employees. At AIR, in addition to overseeing workforce development initiatives, she is continuing to leverage insights from behavioral insights to help the Department improve labor programs. She is co-principal investigator for the second generation of the DOLBI project. She is also helping design behavioral trials aiming to improve employer and worker engagement with the Department’s Trade Adjustment Assistance Program that assists workers left jobless due to overseas competition. Amin’s areas of interest include exploring the potential of self-employment as a strategy for helping dislocated workers avoid long-term unemployment. For the Department of Labor’s experimental Self-Employment Training Demonstration Project, she led intervention development, supervised and supported program delivery in four cities, and conducted an implementation study. The pilot program helped unemployed workers start their own businesses by providing training, one-on-one assistance, and seed capital microgrants. She also contributed to a recent study for Congress on the Self-Employment Assistance Program. Amin is committed to finding effective ways of making research actionable for policy makers and practitioners. As deputy project director of the Department's Clearinghouse for Labor Evaluation and Research, she focused on synthesizing evidence from labor research for policy and practitioner audiences. She has presented on state and local adoption of evaluation and research and behavioral insights to a wide range of practitioner audiences at widely attended workforce conferences. Amin has also conducted extensive research and evaluation international development issues, ranging from sanitation to education to governance in Asia and Africa. While working at the World Bank, she spearheaded a World Bank-United Nations project on promoting the use of data systems to improve disaster response, provided technical assistance for monitoring and evaluation to country teams, and helped design evaluations for legal reform and health and education service delivery projects in Indonesia.